Electronic Martial Arts scoring vest bringing street fighter to life. The world’s best Martial Arts scoring vest powered by XOnano Smartfoam. 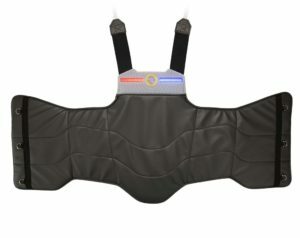 This Smartfoam sparing vest created by 2020 Armor measures impact, severity, and frequency to enable Mortal Combat-like gaming capabilities to Martial Arts. The vest measures each impact event and is used in one and two-player modes to train Martial Artists in multiple disciplines. Front image of Smartfoam powered Martial Arts vest. This vest features two energy bars, like video games. 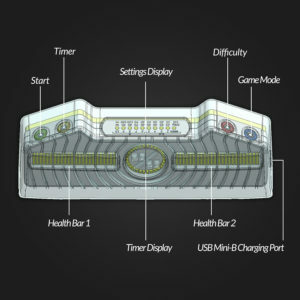 20/20 Armor makes an electronic chest guard that brings the Street Fighter video game to life. This technology gamifies Martial Arts, making it fun and engaging through its multiple built-in game modes, which teach the fundamentals of sparring such as timing, power, and speed. Martial Arts student wearing the 20/20 vest in practice. This vest is used to make training fun and helps club owners significantly increase their bottom line by attracting and retaining students. The founders are club owners and National Team members themselves, with decades of experience. 20/20 Armor aims to be the standard training system for all striking Martial Arts and the official scoring system for the Olympics, with the ultimate vision of making Taekwondo a new professional sport. Measure the speed, accuracy, and velocity of your kicks and punches. What if you don’t practice Taekwondo? No problem. This vest will work with Karate, MMA, Kickboxing, Krav Maga, boxing, and others. No computer required! Take it out of the box and put it on! No special software is required. There are 10 game modes (5 for single players, and 5 for two players). This vest features a six hour battery that begs the question: can your workout outlast the battery? (If so, you’re not working out hard enough…). This vest was designed for every Martial Artist, of every age, height, weight, and gender. This is the first vest to leverage video game scoring in actual hand-to-hand combat.